Encased in a metal suit of armor, Doctor Doom often plays villain to the Fantastic Four. Named Victor Von Doom, he suffered an injury from one of his early inventions malfunctioning, and ever since then he has vowed vengeance on all those he sees as responsible for his misery. Often listed as one of the top villains in the Marvel Universe, Doctor Doom has become an iconic presence in comic book history. Fans of this supervillain will delight in our selection of Doctor Doom apparel and collectibles. 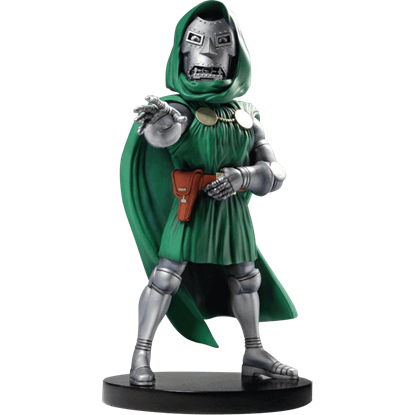 Our assortment of Doctor Doom busts and figures are perfect for adding a menacing touch to any space, and apparel items like our Doctor Doom Uniform Hoodie let any fan don the green cloak and metal mask of this evil scientist for a day. Keep checking our Doctor Doom section here at Superheroes Direct for new additions to our selection. Because no superhero story would be complete without the evil villain, be sure to add the Marvel Classics Doctor Doom Headknocker to your collection of timeless comic book memorabilia, the perfect item for your desk or shelf!